Beyond the debates about multiculturalism, we work on a project for open secularism for the urban world of tomorrow. 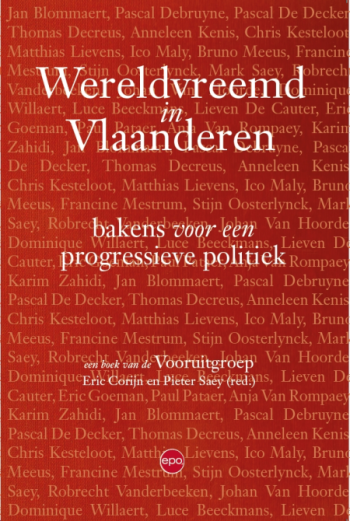 A first concept was developed for the Vooruitgroep (a network of academics, intellectuals and artists) – as part of the book Estranged from the world in Flanders (2014): ‘Diversity: from eigen volk to superdiversity’. A first application was made for De Gentse Lente (a public movement for equality, diversity and active pluralism in the city of Ghent) in the form of an opinion, published on www.dewereldmorgen.be: ‘Forwards with the Ghentian Spring!’, that we publish here. Forwards with the Ghentian Spring! Since May 27th the Ghentian Spring builds a society for the 21th century. After having publicly buried the terms autochtoon (‘native/insider’) and allochtoon (‘foreigner/outsider’ though possibly Belgian), many inhabitants of Flanders cosiest city want to do the same with the ban on wearing a headscarf. For what could possibly be wrong with wearing a religious sign behind a counter or in public office? Why should I not be allowed to show a hint of personality working behind the counter, as a police officer, judge or teacher? Because ‘others’ might suspect I won’t treat them equally or in a just way? But, if I would want to do so, could I not do that equally well hiding everything personal behind the buttons of my uniform or between the pleats of my shirt? If as a Catholic, Muslim, Buddhist, Protestant or Atheist, I want to work for the government, I will have to uphold the worldly equality of all citizens. Then I will have to treat all pupils in my classroom, all citizens at my counter, the quarrelling parties in my court, in a fair and just way. On that one may – no, should, judge me. But to suspect I will not, only because one can recognize me as Buddhist, liberal, Atheist or ecologist, and consequently not allow me to work as a public official? No, that would judge me before I did anything wrong, no? Racism or inducing hatred is forbidden in any self-respecting democracy. But a prejudiced government also limits the tolerance and freedom we need to give a place to anyone wanting to work and participate in a secular society, regardless of his or her conviction or personality. A ban on wearing religious signs therefore seems to me more an obstacle than a stimulus to modernise and emancipate religious minorities, or to spread the values of tolerance and pluralism on which a secular state should be based. However, the arguments in favour of the ban do not only come from people allergic to anything religious because of their worthy activities to separate church and state. Often enough those arguments are the simple result of superseded ways of thinking and irrational fears of Muslims. These past weeks letters of opinion in several newspapers showed many supporters of the ban still don’t accept that in our region certainly not all Muslim women wear a scarf because their religion discriminates them or their husbands make them against their will. Because they, the supporters, all too eagerly want to have their personal interpretation of the Koran or Islam to be accepted by all, the mentioned women included. That way some of the supporters run the risk to interpret the unwillingness of men to shake a woman’s hand as another sexist thing of Islam or Muslim men, whilst the refusal can also be interpreted as a sign of respect by everyone who knows or understands the meaning of the habit. The ignorance sometimes is striking and prejudices can run deep. 9/11 and the security mania that followed ensured that sentences like ‘not every Muslim is a terrorist but all terrorists are Muslims’ became common phrases and that the fear of Muslims entered many if not most homes. It would therefore be a great help if media and government departments were to popularise and spread research (e.g. the work of Professor Robert Pape of the Chicago U.) that clearly shows that not only those sentences are blatantly wrong but also hide the fact that suicide terrorism amongst Muslims is caused by (more than anything else) foreign army troops occupying the Muslim countries. Only when this kind of knowledge becomes common knowledge will more people understand why comparing cultures out of their now global political and economic environment is long since superseded in social science. Only then will more people understand why saying ‘Islam is retarded’ is tragic instead of funny or wise, and will never help to improve living together in a super diverse society. Yet, more than criticizing irrational fear of Muslims, I wanted to summarize anew the most general arguments for what I call ‘open secularism’. A secularism for the world-citizens of tomorrow. When we will have learned not to enclose citizenship, identity and solidarity within the mono-cultural walls of a privileged native people, or to encapsulate them within an indifferent state that blocks more than it opens the road towards diversity, cultural freedom and religious tolerance. On May 27th the Ghentians have reopened that road again. I simply wanted to thank all that have made this Spring possible. CivicLab SERVICES includes a lecture on Diversity and open secularism.